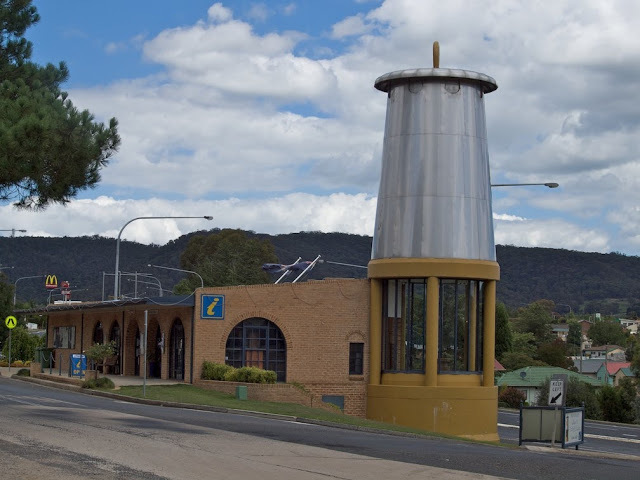 Our journey passes through the small industrial city of Lithgow which is just west of the Blue Mountains. Lithgow has thrived over the years on mining, power stations and other industrial activities - which modern society seems to abhor. Today the city struggles a little but is a nice place nestled in a beautiful part of the country so will not fade away. Like many country towns in Australia it has a "big thing". I took this photo of the big mining lamp in April 2010. It looks the same today. I wonder how long the list of 'Big things' is in Oz. I know when a I travelled north last year I was surprised at how many we passed. according to Wikipedia there are over 150 of them. Big Things turn up all over Canada too. This is a good one. It is among the neater ones around. Some are just plain horrible. Oh, boy, and what did catch my eye? Maccas. It's everywhere here! And not yummy or healthy. Always busy here in Madeley! The power station looks arty, though. You have an eye for detail. Maccas are everywhere. I cdislike their food and never go there, though they do appear to be trying to be more healthy. I've not heard of "big things" before. That mining lamp would certainly seem to qualify. Not heard of big things! You are really missing out on some very tacky stuff. I guess they are rather fun. Silo art seems to be emerging as the new tourist attraction and for the most part that is much better I think. I have posted to a lot of blogs over the years but have now consolidated to just one My Bright Field, the rest of there just for the historic record.